Omaha Hi Lo is a fun and potentially profitable poker variation. It offers a nice change of pace for Texas holdem players and when you learn the best way to play can be more profitable. This page includes sections on how to play and strategy. If you're sure you already know how to play you can skip to the strategy section, but if you have any questions at all about the exact rules it'll only take a couple minutes to read through the how to play section. Did you know you have to use exactly two of your hole cards and exactly three of the board cards to form a hand? In Texas holdem you can use any number of hole cards and up to and including five community cards. If you didn't know the difference read the rules section before moving on. One player is designated as the dealer position, usually shown with a white button with the word dealer on it. The player to the immediate left of the dealer position is the small blind and the player to the immediate left of the small blind is the big blind. The dealer button is passed one player to the left after each hand is completed. The big blind places a forced wager set by the table limits and the small blind places a bet usually half the size of the big blind. In limit games the small blind is half the big blind, but in pot limit and no limit games it can be different. In a 10 / 20 limit game, the big blind is 10 and the small blind is 5. Starting with the player in the small blind, each player receives four cards face down, dealt one at a time to the left around the table. After each player receives four hole cards the player to the left of the big blind may choose from one of the following options. Play moves to the next player to the left who either folds, calls the largest previous wager, or raises. After each player has the opportunity to act the play moves on to the left. When play reaches the small blind she either calls the remaining part of the largest bet above her blind amount, folds or raises. Then the big blind can check if the hand hasn't been raised, fold if the hand has been raised, call a raise, or raise. Play continues to the left until every player has folded or called the highest wager. The next step is the three card flop. The flop is the beginning of the community card area. Community cards are used by all the players remaining in the hand to form a five card high hand and a five card low hand when possible. After the three cards on the flop are turned face up the first player to the left of the dealer button remaining in the hand is the first to act. This player has the following two options. Play continues to the left with each remaining player having the option to check if a bet hasn't been made, or to call a bet, fold, or raise. Play continues to the left until each player remaining in the hand has called the highest bet amount. The fourth community card, called the turn, is then dealt and another betting round structured the same way as the one after the flop is conducted. In a limit game all bets are a set amount. Using the same 10 / 20 example from above, all bets before and on the flop would be 10. All bets on the turn and river are 20. After betting is completed on the turn the fifth and final community card, called the river, is dealt face up. A final betting round, identical to the one following the turn, is conducted. After this round of betting the remaining players show their cards and the winner or winners are paid from the pot. Each player must use exactly two cards from her hand and three of the community cards to form their best five card high hand and best five card low hand if a low is possible. You don't have to use the same two cards to form a high and low hand. You'd use your and with the and to form a low and your and with the and for a high hand. On this occasion you'd use your and with the and for both your high and low hand. The only time a low hand is possible is when at least three unpaired cards eight and below are on the board. The biggest mistake Omaha Hi Lo players make is forgetting they have to use exactly two hole cards and three board cards to form a hand. If no low hand is possible the entire pot is awarded to the player with the best high hand. If two or more players tie for the best high hand they split the pot. When a low hand qualifies, the pot is split between the best high hand and the best low hand. If more than one person ties for the best high or best low hand the half of the pot that is tied is split between the players who tied. Most players don't struggle much when it comes to determining their best high hand, but figuring out the best low hand can be tricky until you get used to how to read the board. The easiest way to read low hands and figure out which hand is lowest is to take each players five lowest unpaired cards and read them backwards like a number. Once you get used to reading low hands it's pretty easy, but don't hesitate to ask the dealer to wait at the end of a hand until you clearly see the value of each hand. The two most popular variations of Omaha Hi Lo are limit and pot limit. It can be played for no limit stakes, but most online poker rooms only offer pot limit and limit. Even the few that have no limit capabilities rarely have players at the tables. If player interest is high enough most land based poker rooms will spread a no limit Omaha Hi Lo game, but you're more likely to find a pot limit game. Though most dealers don't have any problems with pot limit games, it's more difficult than no limit games and it can be slower. Poker rooms don't like anything that slows down the games because the fewer hands per hour they run the lower the rake they make from each table. Most poker players started playing Texas holdem. In holdem, you receive a two card starting hand so at the beginning of the first round of betting you don't know where any of the other 50 cards are located. As players make bets, calls, and raises you can get an idea of a range of starting hands they may hold. When the flop is dealt you know the value of the two cards in your hand and the three cards on the flop, for a total of 5 known cards and 47 unknown cards. You know one more card value on the turn and another on the river. After the river card is dealt you know the value of 7 cards and you don't know the value of 45 cards. In Omaha Hi Lo you know the value of two more cards on each round of betting. While this may not seem like much, it's actually a considerable advantage. Here's a chart comparing the percentage of known cards at each level of a hand in Texas holdem and Omaha. Notice that in Omaha you have twice as much information before the flop as you do in Texas holdem and after the river you know almost 5% more. These higher percentages make Omaha Hi Lo a more predictable and mathematical straight forward game. Smart players use this extra information to make better decisions and make more money than average players. If you're asking why this makes a difference, because everyone has the same amount of information, you need to consider this a different way. Everyone has access to the same amount of information, but most players don't know what to do with the information. Because you have more information by knowing a higher percentage of card values than in holdem, you can determine the mathematically correct play more often playing Omaha Hi Lo. The same basic strategies used in most forms of poker are the ones you should use while playing Omaha Hi Lo. 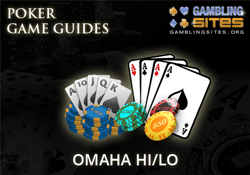 The Omaha Hi Lo specific strategies that you need to combine with common poker tactics are covered in the sections below. The most important thing to remember when deciding what to do in Omaha Hi Lo is that you need to put yourself into position to scoop pots. While you can make a little money winning half the pot, the real money is in scooping and winning three quarters of the pot. You have two ways to scoop pots. You can win both the high and low part of a split pot or have the best high hand in a pot that doesn't have a low possibility. Every decision you make needs to be made with an eye on scooping possibilities. Of course most hands don't play out in a way where you have a choice, but if you had to pick having a best high hand or a best low hand you want the best high hand. High hands are rarely split while low hands are split often. To give yourself the best chance to scoop a pot you need to play high only hands and two way hands. A high only hand has high pairs, face cards, large suited cards, and other combinations that give you a strong chance to have the nut high hand on a high only board. Two way hands almost always have an ace in combination with one or two low cards and one or two high cards. If the ace is suited to one of the other cards it makes the hand stronger. Most Omaha Hi Lo players enter any pot where they hold an ace and a two, so low hands that don't have an ace and two on the board are often split between two or more players. In this case the player with the best high hand gets half the pot and the two players with the tied low hand each receive a quarter of the pot. Sometimes a player will tie for low and have the best high hand, receiving three quarters of the pot. You want to avoid only winning a quarter of the pot, called being quartered, as often as possible. Unless a great deal of money is in the pot from early in the hand from players who don't win part of the pot, it's difficult to come out ahead in a hand where you've been quartered. If three players tie for the best low hand it's even worse. This is the main reason when you consider starting hands it's important to have some chance at a high hand when you have a strong low starting hand. You need to win the high half of the pot in combination with the low half, or part of the low half, in order to turn a consistent profit in the long run. Texas holdem players often see top pair top kicker hands hold up and usually win with a flush, even if it's only jack or ten high or when the board pairs. In Omaha Hi Lo you rarely win with hands like these. While the nuts aren't always required to win a hand, the average value of winning hands is higher than in Texas holdem. Anything below a set is unlikely to win a high hand. Straights and flushes are closer to the average high hands and if a full house is possible try not to bank on winning the high half unless being the one with the full house. A full house is only possible when the board pairs because you have to use two hole cards to form a hand. The rule of thumb is if you're drawing you need to be drawing to either the nuts or a strong enough hand that you're a huge favorite to win when you hit. When the board is paired the nuts is four of a kind, but the top possible full house is good enough to draw to if the pot is offering the correct odds. The next rule of thumb is never draw to a low that isn't the nut low. You end up getting quartered with low hands too often to take the chance to draw to a second or third best low hand. If you have a two way hand it can be profitable to draw to a second or third best low, but only if the high half of your hand is strong. Drawing to a second best low and a second best high can be marginally profitable in some games, but it can cost you a great deal of money at times. Here's an example of a recent hand we played. After the flop we had a set of kings and a draw to the second best low with two other players in the pot. It was a limit Omaha Hi Lo game and we bet and raised a few times before the turn. The turn added a draw to a straight and bets continued being made. The turn completed the low, so we had the second best low and the second best high hand. The betting was capped on the river and we ended up losing both sides of the pot. We got stuck in the hand because by the time the river card was dealt the pot held enough that in the long run we had to stay in the hand. The only thing we could have done differently was minimize our exposure early in the hand, but at the time we had the best high and a draw to the second best low. In other words, we lost a big pot but will play the hand the same way in the future. If the board had paired on the river instead of completing the low we'd have scooped a big pot. The board will pair enough times for the play to be profitable. We'll also win either the low or high enough times for the play to be profitable in the game we was playing. The secret is to know the best way to play a hand and then play it that way no matter what the outcome. We lost a big hand but won't let that change how we play in the future. Starting hands need to have four cards that work together in some way. Hands with three strong cards and an unrelated fourth card can sometimes be played, but overall they're much weaker than cards with four cards that support each other. The hands listed above in the scooping section are all good starting hands. If you skipped that section go back to see examples of strong high only hands and good two way hands. The player entering the hand with the best Omaha 8 starting hand is going to win more often than the players with the weaker hand. This means that you need to start concentrating on playing better hands than your opponents. The only way to do this is to play fewer hands. You need to play fewer hands than most Texas holdem players play, not more. Just because you have twice as many starting cards doesn't mean you can play twice as many hands. We've played in many pot limit games profitably while seeing close to 15% of the flops. 20% is a good percentage to shoot for in a full ring game, but at the lower levels you should be able to play profitably as long as you stay at 25% or lower. As you start facing better competition you'll probably need to get tighter unless your post flop play is very strong. Some players can play more starting hands profitably, but as you're learning to play you're not one of them. Until you get really good at making the correct plays almost every time after the flop you need to concentrate on entering pots with better hands than your opponents. Here are some examples of starting hands that work together. You have three great cards to a low, two different high flush possibilities and an ace and king for an outside shot at a high straight. When you start playing you get excited when you see starting hands like this but then half the time the flop doesn't help. It's ok to get excited, but the hand still needs to improve to win. A double suited pair of aces with a 2 and a 3 is the best possible starting hand in Omaha Hi Lo. But don't get attached to it after the flop. A flop with a high pair and nothing to help you with four opponents is bad news. This hand needs help to win in the form of a 2 on the board for a low hand and / or a queen for a high set. It's still a nice two way hand and worth seeing the flop with, especially in a heads up situation. Here are some examples of starting hands that have a small problem but can still be played from late position. This hand doesn't have a flush possibility but does offer a chance at the nut low and has two high cards in the ace and king. The 8 is almost worthless, but in a heads up hand it can offer a small amount of counterfeit protection. The ace and king will rarely combine for a winning high hand so this hand is one of the weaker ace two hands. You can play most ace two hands in most low limit games, but we've been in games where this hand should be folded from early position or when facing a raise or two. The seven is worthless except it's suited with the ace. If the flop doesn't have a two helping you on your way to a possible nut low or at least two spades you probably need to get out of the hand quickly. This hand should only be played from late position in most games. You don't want to play the second set of hands from early position unless you're able to play a strong game after the flop and get paid off when you hit. If you have any questions about whether or not to play a hand you should fold. If you're an above average Texas holdem player you probably understand how important position is when playing poker. Position is not as important in Omaha as it is while playing Texas holdem, but it's still important. The simple fact is if your opponents have to act before you have to act you have more information than they do when you have to make a decision. Omaha is a game of information. The player with the most information has the best chance to win in the long run. When you consider your position at the table in every decision you make your Omaha profits will start climbing. Combining proper starting hands with positions awareness creates the first steps in profitable Omaha Hi Lo play. As a player trying to learn beginning strategy, you've already learned about most of the important things to concentrate on. At the lower limits if you play 20% of your starting hands, learn how important position is, and concentrate on finding opportunities to scoop pots you can quickly become a break even or winning player. In most low limit games you can break even by just playing fewer hands and playing straight forward poker. Much of the low level competition is so bad that you just need to follow the directions on this page and pay attention. Track every hand you play and pay attention to the other players. Know exactly how many flops you see and which opponents have poor playing habits. If you learn an opponent always calls down with second and third best hands you know he'll pay you off in scooping situations. If you learn an opponent only plays ace two hands in low pots from early position you'll know to avoid second best low hands when facing her. You can find a million things about your opponents that are helpful if you just start paying attention. Intermediate Omaha Hi Lo play is when you're able to break even or start playing for a small profit. You understand position, have a solid starting hand understanding, and can recognize scoop situations and when you need to get out of a hand most of the time. At this point you're starting to understand Omaha Hi Lo better and feel like you can beat most of the games filled with poor players. We've listed four different areas intermediate players need to understand to advance to the next level. They aren't the only intermediate strategy ideas in the world, but each of them is important if you want to win in the long run. One of the big turning points for most Omaha Hi Lo players is when they realize how much it's worth to know when to fold after the flop instead of chasing long shots and second and third best hands. In many pot limit games you can win a few big pots that can make a session profitable even if you don't win any small pots. Just because you have a pair of aces before the flop doesn't mean the pair of kings on the flop didn't give your opponent a set. The less money you put in the pot after a bad flop the more you'll have to play pots that have scoop possibilities later. We almost included this in the beginning section, but almost every beginner ignores advice about table selection so we've included it here where we hope you'll learn from it. Take a few minutes to consider the competition at the table before you start playing. If most of the players at the table are worse players than you it's bound to increase your chances to win. We'd rather play with eight players who weren't as good as us than eight players who're better than us. Even if it takes extra time, find games that offer the best chance to win. When you have a low hand and one of the low cards in your hand lands on the board it's called getting counterfeited. You have and the board is so you have the nut low. The turn is the so you still have a low but it's no longer the nut low. If you had a 5 instead of the jack it would have offered counterfeit protection. You don't have to only play hands with counterfeit protection, but if you get involved in a big pot with only a low possibility you need protection. Beginning players don't tend to think ahead too far in the hand, but at this level you need to start seeing things like this and planning for the possibility of getting counterfeited. Heads up hands are closer in value than in Texas holdem. In holdem a pair of aces is dominant over a hand with a 9 and a 5. The pair of aces will win a high percentage of the time. In Omaha Hi Lo, the best hand isn't nearly as dominant against the weaker hands in heads up play. This is especially true if the weaker hands have any possibility of low. Even a hand with 5 and 8 or 6 and 7 can make a low if the opponents hand doesn't have a low possibility or gets counterfeited. As three or more players enter most hands at low and medium levels, you can't play your poor hands, but you need to understand the possibilities when hands get heads up. If the hand gets heads up on the turn or river, your fourth best low with your second best high is probably enough to call a bet. When poker players get to an advanced strategy stage the game has gone beyond simple steps and discussions. In order to get to an advanced level of Omaha Hi Lo play you have to move to a state of mental awareness about the game and your opponents. Advanced players enter every hand with a plan for every possibility. You need to consider what you're going to do if an opponent raises and what you'll do when you miss the flop, when you hit the flop, or when you flop a good draw. You want to get to a point where everything you do at the Omaha Hi Lo table is because it's the best play in the long run. You won't always know exactly what your opponent holds but you'll be able to narrow her possible holdings down to a few possible hands. Every decision has a most profitable or least costly way to play. Some decisions lose money in the long run, so in these situations you need to find the least costly way to play. Here's an example of a situation that loses money in the long run. Any time you're in the small blind with a terrible hand you'll lose money no matter what you do over the long run. In order to lose as little money as possible, the correct play is to fold in the small blind with poor hands. Amateur players look at the money in the small blind as a commitment to the pot. They think it's only a half bet to see the flop and anything can happen on the flop, especially since they have four cards instead of two. Once you understand that you should fold almost any hand from the small blind that you would fold from early position you've started moving into advanced play. The money you put in the pot in the blinds is just a small fee required to have the opportunity to scoop huge pots at other times. Once the money is in the pot it's no longer yours. The same thought process is needed in the big blind. If an opponent raises and you have a poor hand simply fold. Don't defend your blinds with weak hands unless you're a top player and know your opponents very well. When you're in the big blind and the pre flop play is checked to you with a weak hand you'll see the flop, but don't invest another dollar in the pot without a monster flop for you. The blinds are just two examples of how your thought process needs to be in order to play Omaha Hi Lo at an advanced level. As you advance from the low limits to the medium limits your opponents get a little better, but the game and correct strategies are much the same. But when you start playing at the highest limits the game changes quite a bit. Before going on, you should know that plenty of really good players stay at the medium levels and make good money. You don't have to play at the highest levels to be a pro and be profitable. At the highest levels most pots are contested heads up or at the most with three players seeing the flop. Almost all hands are played with at least one raise pre flop. Think about some of the ways this changes the game. When you're playing heads up the second best high and the second best low will almost always win at least half the pot and will have a good shot at a scoop. It's difficult to cover advanced Omaha Hi Lo strategy in print because you either have enough experience to understand it or you don't. The good news is if you're a beginning or intermediate player you can work toward advanced play. Concentrate on the other things covered on this page including starting hand selection, position; always trying to make the best possible play in every situation, and develop a plan in your mind for every decision and you'll be well on your way toward winning play. You can find entire books written about Omaha Hi Lo, but if you start using everything you've learned on this page you should be able to break even or start turning a small profit at the lower levels. As you gain experience you'll get better and start being able to move up to higher levels.